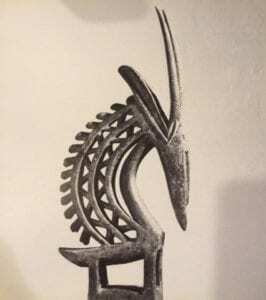 What moved my father so much about African art was the “dignity and directness of expression which the people had succeeded in bringing to implements used in ceremony, in war, in daily living.” The viewing of African masks and sculptures in relationship to German expressionist paintings had a particularly profound impact on both my parents. They sensed a power in the tribal pieces that neither of them had noticed in more “sophisticated” Western art forms. According to my father’s writings, their first meaningful encounter with African art occurred in the late 1940s on a trip to Germany. At the time, few American museums showed African material and there were practically no dealers. 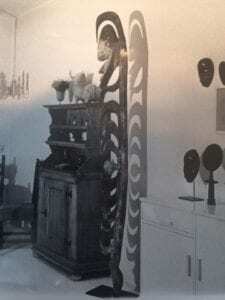 If you wanted to see good tribal art, you had to visit, as my parents frequently did, the British Museum, the Musee de l’Homme in Paris, and the Tervuren Museum in Brussels. Slowly, on a piece by piece basis, they began to collect. But how did they do that? You couldn’t just go to Africa and pick up a few pieces – not without immense knowledge. This was different from buying a Renoir, for instance, where the painting would have a provenance, a history and a value tied into the market that made sense to the buyer. Also, as interest in African and ethnographic art began to grow, there was a corresponding proliferation of fakes. 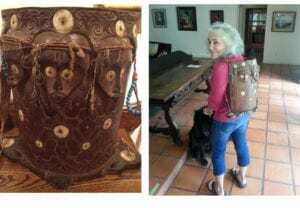 It took a lifetime of study to distinguish real from counterfeit, and even then there were frequent question marks, as with the baby carrier below, which my sister and I put in auction at Sotheby’s in 2009, and which had to be pulled at the last minute because it was determined to be a fake. Even as a fake, the piece was valued at about $6000 because it was so well-made. The dealer my father did most business with was John J. Klejman, whose gallery, next to the old Sotheby’s Parke-Bernet on Madison Avenue, always had a security guard at the door. Klejman was a bit of an enigmatic figure. If you google him, he is described as “legendary” because he was such a groundbreaker in the world of African and Oceanic art. He always had rare, difficult-to-find, and extremely valuable pieces. Tiny gold pre-Columbian birds, classical Greek and Roman busts, Byzantine jewelry. I loved going into his – to me at the time – cavernous gallery because it was dark, a little creepy and filled with treasures. Well. If Franyo knew one thing, it was accents. This Klejman in his immaculate dark suit was a Jew from Poland, probably Warsaw. (She was right; he’d started as an antiquities dealer in Warsaw.) What was his snootiness about? She decided to ignore his behavior and made arrangements to bring Gustavo back to see the antelope. It was the beginning of a long and fruitful connection. If you thumb through primitive art auction sales catalogues looking for provenances, Klejman’s name often pops up, gold on the market because, to this day, it carries so much weight. But he was very hush hush about his origins. There were stories about him and Halina during the war, that they handed their small daughter over the ghetto wall and didn’t see her again until she was eight years old (I believe she had been transported to Denmark); that they covered up their Judaism because they’d endured horrors they never wanted to live through again. Somehow when you met them, you knew not to ask questions. They were quiet and distinguished in good jewelry and well-cut clothes. They were extremely skilled at what they did. But even as a young girl I sensed something dangerous beneath the surface. Perhaps it was my overactive imagination. There were a number of dealers my parents did business with, but none had the same air of mysteriousness as the Klejmans. And none had quite the same impact on the art world. When they closed shop and retired, it was just like their voices and everything else about them, hush hush and a little secretive. I think they went to Switzerland. One just never heard much about them again.